Eastern Wyoming College is pleased to announce that thirty-five students were inducted into the Phi Theta Kappa Honor Society on January 25, 2018. This is the largest class of PTK inductees in EWC’s history. Phi Theta Kappa is the world’s largest and most prestigious honor society for two-year college students. Students inducted into the Alpha Omicron Lambda Chapter of PTK include: Gonzalo Arcelay, Munguia, Spain; Taylor Bell, Ft. Washakie, WY; Pamela Bethel, Nassau, Bahamas; Baxter Boldon, Buffalo Gap, SD; Shane Brown, Torrington, WY; Emily Buchanan, Yoder, WY; Sara Burton, Saratoga, WY; Allie Dunaway, Torrington, WY; Kodi Edwards, Wright, WY; George Elliott, Salisbury, UK; Elizabeth Foos, Torrington, WY; Timothy Franks, Florence AL; Shaniah Freeseman, Gordon, NE; Morgan Frein, Torrington, WY; Morgan Harmon, Spencer, NE; Tyler Hunt, Torrington, WY; Jacee Jinks, Yoder, WY; Heather Kraus, Torrington, WY; Tyler Lane, Torrington, WY; James Meyer, Wheatland, WY; Lauren O’Connell, Houston, TX; Rylee Perkins, Torrington, WY; Emily Reed, Paxton, NE; Tayte Rodriguez, Torrington, WY; Brianna Santora, Cheyenne, WY; Trey Schroefel, Buffalo, WY; Sadie Schwartzkopf, Brule, NE; Jaslyn Seeley, Sundance, WY; Morea Shipley, Lingle, WY; Signe Simpson, Sundance, WY; Paige Vitosh, Odell, NE; Regan Walford, Lingle, WY; Precious Williams, Alliance, NE; Libby Winchell, Scottsbluff, NE; Emily Zavorka, Yoder, WY. The keynote speaker for the event was Mr. John Hansen, EWC’s Director of Development. 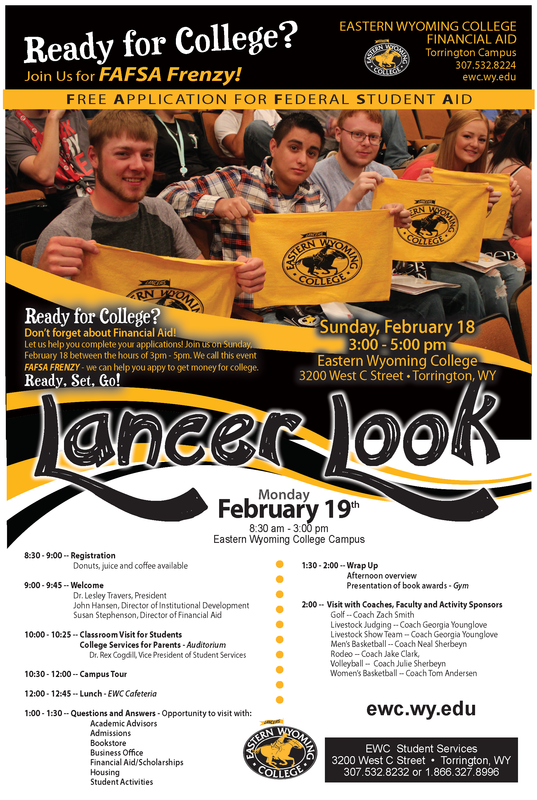 Eastern Wyoming College announces upcoming events at the Lancers basketball games. The January 26th Lancer basketball game originally scheduled with Fort Carson and then changed to Fort Peterson has been cancelled due to deployment. There will not be a game at 6:00 pm. January 29th at 5:30 pm in the Petsch Center gymnasium, the Lady Lancers will host Laramie County Community College. The EWC Men’s Basketball team will have events at half time, and will sign posters after the game. Please come out and support your Lady Lancers and meet the Lancers after the game. February 3rd at 5:30 pm and 7:30 pm in the Petsch Center gymnasium is Banner Health Pack the Gym Night. The Lancers will host Western Nebraska Community College. Money is being raised by both EWC Student Senate and Banner Health for the Kiss the Pig event that will be held at half time during the men’s game. The person with the most donations at half time will “Kiss the Pig”. All donations will be given to the American Heart Association. EWC’s American Wyoming Government class student service project is collecting non-perishable, non-expired items for EWC students in need. These items can be food or toiletries. Please bring your donations to the game. Please join us for this great family event and support your Lancer basketball teams. Eastern Wyoming College announces EWC Booster Club White Out Night, January 19. Join the Lancers in the Petsch Center gymnasium at 5:30 and 7:30 pm as they host McCook Community College. Meet the EWC Region IX Golf Champions and get an autographed poster. The Region IX Golf Championship banner will be raised during half time of the men’s game. Please come out and support your Lancers basketball teams. Eastern Wyoming College-Douglas Campus, announces that it will host a site review for initial accreditation of its Associate Degree in Nursing (ADN) program by the Accreditation Commission for Education in Nursing (ACEN). The public is invited to meet the site visit team and share your comments about the program in person at a meeting scheduled at 7pm in room #122 on Tuesday, February 20, 2018 at the Douglas Campus, 800 South Wind River Drive, Douglas, Wyoming.